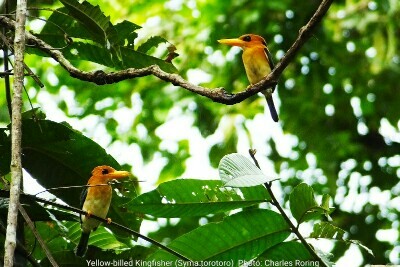 Common Paradise Kingfisher (Tanysiptera galatea) - I saw the bird for the first time in Susnguakti forest of Manokwari. It was a lower montane forest of Arfak mountains. I was guiding an expatriate family from Beijing. At that time they were watching Lesser Bird of Paradise. I was waiting at lower slope. I sat quietly and did not make any movements or sounds. After sitting for 30 minutes, suddenly I heard a bird landed on a higher branch of a tree on the right of me. I did not know what it was but I quickly turned on my digital camera Fujifilm Finepix HS50 EXR and aimed it at the bird. He was sitting on the branch for less than 5 seconds after that he flew away. This bird looks very similar to Little Paradise Kingfisher and Kofiau Paradise Kingfisher but different in size, length of the raquet tails and coloration of the feather. In general, the Common Paradise Kingfisher has got longer tails. In field guide book: Birds of New Guinea, the juvenile has got significantly different colors. We may think the juvenile as a different species. I also have got another opportunity of taking pictures of the bird again when I was guiding a Filipino lady in a 3 day/ 2 night hiking and camping tour in the forest. We were waiting for the Lesser Birds of Paradise to show up. She was the first to see the bird. I told me where he was by pointing her finger to the bird. This time the bird was around 10 meters away from me but at a lower branch of a tree. So, I had a near eye level shooting position. I carefully took out my camera and made multiple shots. I could not shoot the whole body and tail of the Common Paradise Kingfisher but I was quite happy with the results. The blue head, orange bill, white chest and shiny black of his eyes look beautiful in the picture. 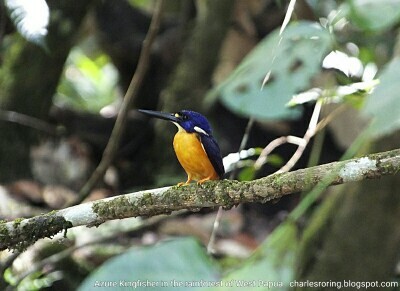 I also saw the bird in Klasow valley but I could not make any pictures of this blue feather kingfisher in that forest. 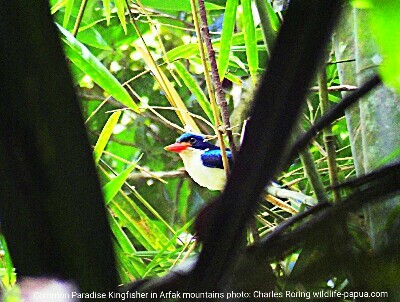 As a matter of fact in West Papua, based on the map of bird distribution, the Common Paradise Kingfisher can be found in coastal area of Manokwari, Arfak mountains, Tambrauw Mountains, Sorong regency, Raja Ampat (Waigeo, Gam, Batanta, Salawati, except Misool), South-Sorong regency, Maybrat regency, Fakfak, Kaimana, Nabire, Waropen region, Jayapura and its surrounding lowland and lower montane forest and some parts of Tanah Merah region of Merauke. Yellow-billed Kingfisher (Syma torotoro) - This is a small kingfisher that lives in lowland and hill forest of New Guinea. I had the opportunity of watching and taking pictures of both male and female birds when I was guiding a Chinese lady on a 2-week private bird tour across West Papua highland and lowland region. We were walking and exploring the bush near a village to find King Bird of Paradise when we heard the calls of the kingfishers. The sounds of these kingfishers were loud and could easily be recognized by birders who were familiar with them. It was not easy to find these birds because they were small. Finally, we could see them at the forest edge. We walked to the clearing area of the forest to get better view of them. With the sun was at our back, we could see the couple clearly. They were sitting on higher twigs. October was a mating season. We were excited to see them I and the Chinese lady took some very good pictures of the birds. For presentation in this website I resize the picture to maket smaller. The juvenile Yellow-billed Kingfisher has got black bill. 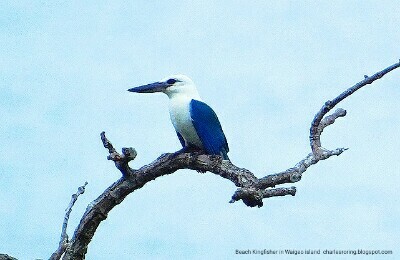 Beach Kingfisher (Todiramphus saurophagus) - I saw this big kingfisher when I was traveling to Raja Ampat archipelago. 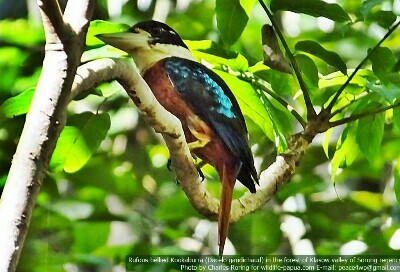 The bird was bigger than the average size of other woodland and river kingfishers in mainland West Papua. in the mornings and in the afternoons, the bird likes to perch on the branch of trees that grow along the beach on the wooden jetty and posts made by fishermen in shallow water. Beach Kingfisher eats fish. One day, I was traveling to Waisai town to attend a meeting for tourist guides. It was held in Geopark Building near the harbour area. I was standing at the front yard when I saw a Beach Kingfisher landed on a naked branch of a tree near the beach. The bird was approximately ten to fifteen meters away from me. Because I was standing at higher ground, I could make good picture of the bird. Azure Kingfisher - This small has got dark blue wings and back with yellowi chest and belly. I saw it for the first time in Dopi river of Manokwari when I was guiding two Swedish couple on a three-day hiking, camping and birding tour. The bird was sitting on top of a small wooden stick that stood over a small river waiting for its prey. The Swedish lady used her spotting scope to watch the bird and allowed us to see it too. Unfortunately, I did not have a telephoto camera to shoot it. I had another opportunity to watch the Azure Kingfisher when I went birding in Klasow valley with a Dutch tourist. We were sitting at the bank of a river when the bird landed on a hanging vine. I immediately took out my Fujifilm Finepix HS50EXR camera and shoot the bird several times. I was lucky at the time. I made some beautiful photographs. Rufous-bellied Kookaburra (Dacelo gaudichaud) - This is a woodland Kingfisher that I frequently see when I go birding in tropical rainforest of Sorong, Susnguakti forest of Manokwari, Fulgidus forest of Tambrauw regency, and Waigeo island of Raja Ampat. The bird can easily be identified by its white bill, dark head and rufous underparts. Most often the bird sits alone on the branch of a tree waiting for its pray In the mornings, a couple of the birds like to perch on naked branch of a tree to enjoy the warm light of the sun. I offer birding tours for anybody who is interested in visiting Manokwari, Arfak mountains, Numfor island, Klasow valley, Sorong, and Tambrauw mountains in West Papua province of Indonesia with me as a tour guide. The tour can be a private tour or an open tour where other visitors can join. Please, book your tour by contact me (Charles Roring) through e-mail at: peace4wp@gmail.com or send whatsapp message to my number: +6281332245180.